The shape of hospitality is always changing—and challenging. Take the boom in off-premise and takeout, for example, that is expanding foodservice beyond the four walls of the dining room. That trend is driving both commercial and noncommercial operators to rethink their packaging needs—from a practical operational standpoint as well as when it comes to addressing consumers’ needs and desires. The tide of takeout is rising: 49% of 18- to 34-year olds say they are ordering food to-go more often now than they were three years ago, with 36% saying they prefer to order food to-go rather than dine in (except on special occasions), according to Technomic’s 2018 Takeout & Off-Premise report. Indeed, says Technomic, consumers order food to-go (including pickup/takeout or delivery) from a restaurant an average of 5.5 times per month. But is commitment to the environment and sustainability possible without making a sacrifice in performance and the bottom line? Yes, says WinCup. 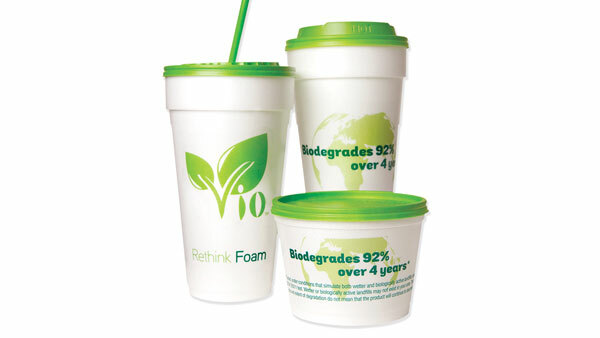 The company’s flagship eco-friendly product, Vio™ biodegradable* foam cups and containers, are the first expandable polystyrene (EPS) foam products specially formulated to biodegrade 92% over 4 years. Vio also produces biodegradable lids and straws, allowing foodservice operators to enjoy a complete disposable product solution that’s environmentally sustainable. However, with takeout and delivery business, it is necessary to educate staff so they can communicate the earth-friendly facts to customers. Fortunately, Vio’s biodegradation claim is printed right on every cup and container. Additionally, staff can inform customers that the production of foam consumes less energy, creates less solid waste and uses less water than that of foodservice paper products.